Adventure Time: Explore The Dungeon Because I DON'T KNOW! 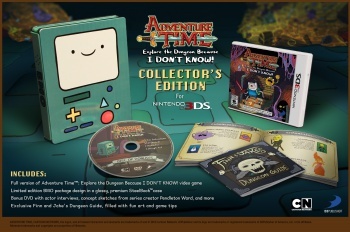 's collector's edition is exclusive to the 3DS because I DON'T KNOW! Adventure Time: Explore The Dungeon Because I DON'T KNOW! is shaping up to be quite a neat looking game. It is a 4-player co-op hack-and-slash, that is inspired by those brutal roguelikes of old. Hype has been quietly building ahead of it's November 12 release, and the latest is a special collector's edition exclusive to the 3DS version of the game. The special edition comes with the game, a limited edition BMO steelbook case, a bonus DVD with actor interviews, concept sketches from series creator Pendleton Ward, and an exclusive Finn and Jake dungeon guide. In the game, Players strive to save the Candy Kingdom by exploring the mysterious Secret Royal Dungeon deep below the Land of Ooo. Pendleton Ward will be including a "huge reveal," which will eventually come up in the show, and players will have to complete the game to find. Adventure Time: Explore the Dungeon Because I DON'T KNOW! features the voice talents of the show's most popular characters, including John DiMaggio (of Futurama fame) as Jake. Playable characters will include Finn, Jake, Marceline, Ice King, Cinnamon Bun, Flame Princess, Lumpy Space Princess, Lemongrab and Peppermint Butler. Ward is working closely with developer WayForward technologies to ensure the game accurately portrays the Adventure Time style. Why the edition is exclusive to the 3DS and not any of the other platform's is anyone's guess, perhaps because the show's BMO character most resembles Nintendo's GameBoy?